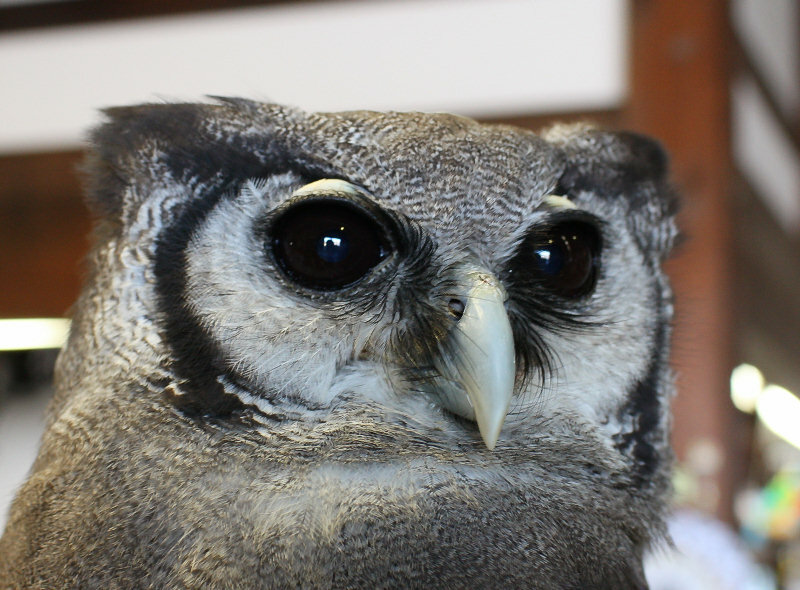 Today, January 10th, we show you two Verreaux's Eagle Owls that started greeting visitors near the reception board since last month. 1월9일 오늘은 지난해 12월부터 당원의 카운터부근에서 손님을 맞이하고 바래주는 역할을 하고 있는 두마리의 큰수리부엉이를 소개드리겠습니다. 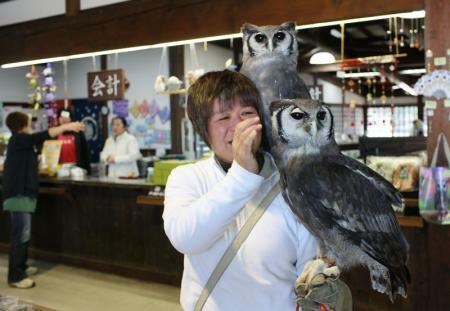 Ms. Kawai, who has long been in charge of owls in Fuji Kachoen(a sister garden of Kakegawa Kachoen), is in charge of the service, with an aim to make owls more popular among visitors. 당원에 오신 손님이 더욱 가까운 곳에서 부엉이를 만날수 있었으면 하는 생각으로 자매원이 후지화조원에서 오랫동한 부엉이담당을 해온 카와이씨가 부엉이와 함께 카운터부근에 나타나게 되였습니다. 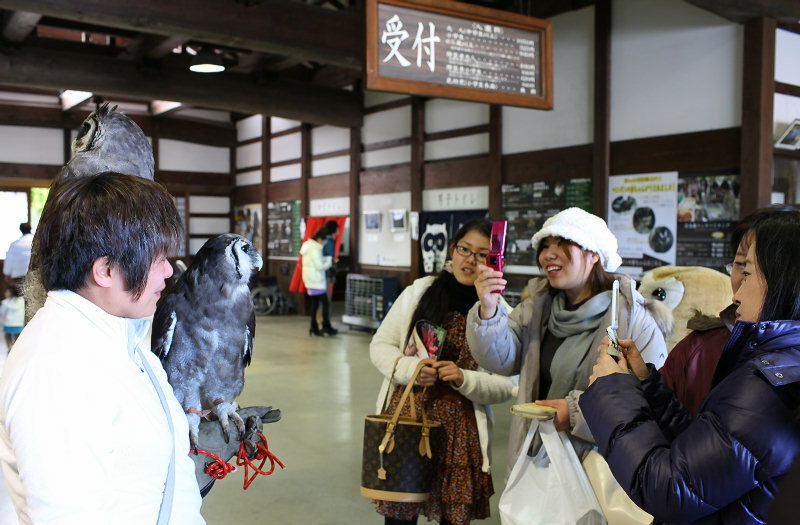 Gracy and Jeremy the Verreaux's Eagle Owls that greet the visitors here were brought from the United Kingdom 10 years ago when the owls were brought into Fuji Kachoen for the first time. 여기서 등장하는 큰수리부엉이의 이름은 각각 구레시와 제레미인데 이 두마리는 10년전에 후지화조원에서 처음으로 새를 구입할 때 영국에서 들여온 부엉이입니다. 카와이씨는 이 두마리를 어깨와 팔에 얹혀서 당원에 오신 손님께 부엉이에게 먹이는것은 병아리나 쥐라든가,목을 270도 돌수 있다든가 등 부엉이와 관계되는 여러가지 지식을 들려줍니다. Verreaux's Eagle Owl is a large owl about 65cm long weighing 2kg, widespread in savannahs in Africa from sub-Saharan region to South Africa. 큰수리부엉이는 아프리카사하라사막이남으로 부터 케이프타운에 걸친 열대초원에 널리 분포되여 있는 대형부엉이로서 몸 길이가 약 65센치,무게가 약 2킬로 정도입니다. A shot of Jeremy, showing big, cute round eyes. 이것은 제레미인데 머루알같이 까만 눈동자가 아주 귀엽습니다. 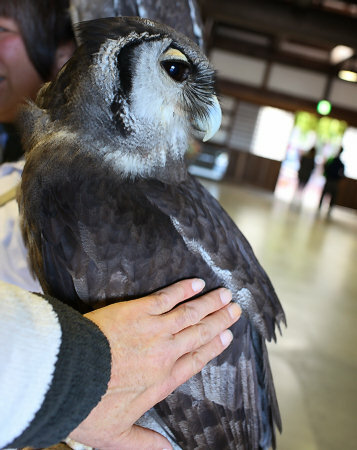 You can even touch it, but only on its back, it may be scared when it is touched on its face or head, she said. 또 이렇게 만질수도 있습니다.얼굴이나 머리를 만지면 무서워하기 때문에 등을 만져주세요 라고 카와이씨가 말했습니다. 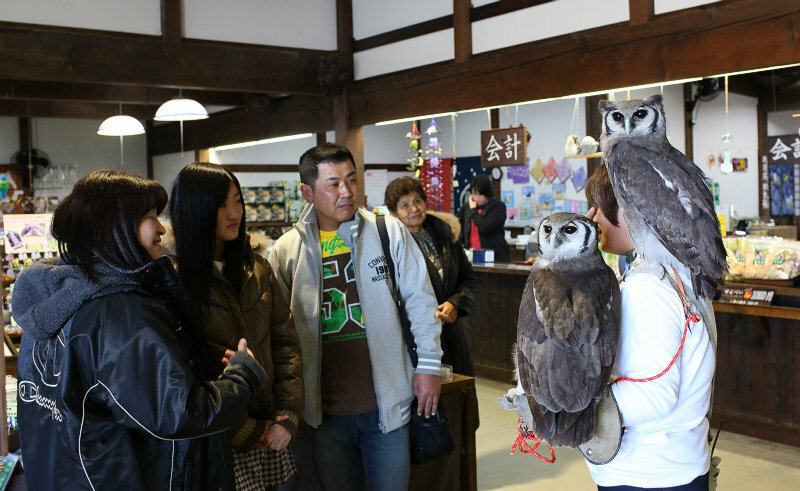 All visitors look curiously at the huge owls that are first birds to be in the sight when they visit the Garden. 당원에 오시면 우선 새가 보고싶은 법.그런 손님께 가장 먼저 다가온 것이 큰수리부엉이니,모두들 흥미진진하게 보고 계셨습니다. Ms. Kawai with the owls. You can see the owls near the reception board except when Ms. Kawai is off or when she goes out to help the flight show. 큰수리부엉이와 카와이씨.이 부엉이들은 카와이씨가 휴식하는 날과 카와이씨가 비행쇼등의 준비를 하고 있는 시간이외에는 당원의 입구부근에서 볼수 있습니다. Please check them out during your visit. 당원에 오시면 꼭 보고 가세요.